BERLIN — The world's most powerful woman has been such a constant presence in German politics that a verb has been derived from her name. While "merkeln" means to delay a decision or deliberate, Angela Merkel's modest style has also earned her the nickname “Mutti" — or "Mommy." Presiding over the planet's fourth-largest economy, the former research scientist is widely considered to be the leading light of the post-World War II order and a counterweight to President Donald Trump. "There is a sense that there is no great problem that she couldn’t overcome and that she’s a politician you can trust"
Polls suggest Merkel will be elected Germany's chancellor for the fourth time on Sunday, a post she has held since 2005. But people in Merkel's homeland perceive her rather differently. The verb "merkeln" is used more with affection than malice, but it is also indicative of a frustration with her approach to politics. However, the 63-year-old Merkel’s trustworthiness and centrist policies have endeared her to many German voters. Combined with a healthy economy and global uncertainty, that reputation has made her a tough incumbent to beat and given her party a double-digit lead in the polls over the Social Democrats (SPD) and their candidate Martin Schulz. “It’s very German to stick to what is working,” said Norbert Lösing, 53, who was browsing at a secondhand book fair outside Humboldt University in the capital. “There are a lot of problems in other countries, think Donald Trump or Brexit … with Merkel there is a sense that there is no great problem that she couldn’t overcome and that she’s a politician you can trust." Sebastian Oehme, who was working in the hip Kreuzberg area not far from Checkpoint Charlie, a former crossing point between what was once East and West Berlin, suggested that most Germans were satisfied with the status quo. "A lot of people enjoy a certain level of financial security so they don’t see the need for a radical new plan,” the 36-year-old said. Merkel's Christian Democrats (CDU) appear to understand her unique appeal. In addition to ubiquitous posters in German city centers, enormous billboards featuring the chancellor tower above highways near Frankfurt, Berlin and elsewhere. Merkel stares kindly into the camera. No slogan accompanies her portrait only a date — "24.09" — a reminder of Sunday’s federal election. Presidential-style campaigning is rare in Germany where politics has traditionally focused on parties rather than personalities. “In the eyes of German voters, Merkel represents stability, calm, steadiness and prosperity,” said Thomas Walde, who hosts a weekly politics show on NBC News’ German partner broadcaster ZDF. The desire to stay in middle ground is also “very typical of many Germans,” according to Dr. Martin Klepper, a professor of American studies at the Humboldt University in Berlin. Merkel appeals to "all kinds of people," including members of the rival Social Democrats and liberals, he said. "I think that’s the secret to her magic, to her success." More voters in Germany define themselves as centrist than in any of the other six largest European states, according to a recent survey. German think-tank Bertelsmann Foundation found that 80 percent of German voters described themselves as either center-left or center-right, compared to a European average of 66 percent. Around 350 miles southwest of Berlin, Lore Freitag pushed her bicycle across the market square of a place that has been described as the country's "most average village." Hassloch is Germany’s bellwether town. The consumer research industry uses its residents as guinea pigs to try out new products as its 21,000 inhabitants are broadly representative of the population. The 80-year-old mother of 15 children said she planned to vote for Merkel. “I’ve seen her on television and she’s a very simple, humble and a down-to-earth woman,” Freitag explained as construction workers prepared for a local beer festival. Across the square, Iris Drotlett, who is heavily pregnant with her third child and was watching her young daughters play, agreed with Freitag’s assessment. “People know her, she’s a safe pair of hands,” the 41-year-old said. But despite her popularity, the 2015 TIME Person of the Year who has also topped Forbes' list of the world's most powerful women 9 times isn't likely to secure a majority. Merkel’s CDU are currently polling 36 percent of the vote. That opens up the possibility of another so-called “grand coalition” with their current partners — the Social Democrats. The far-right and anti-immigration Alternative For Germany (AfD) appears to be on course to enter the national parliament for the first time this year and may even become the country’s third-biggest party. The AfD’s meteoric rise has been galvanized in large part by Merkel’s 2015 decision to open the country’s borders, allowing more than 1 million refugees to since seek asylum in Germany. They have exploited the concerns of many Germans that the influx will have a negative impact on their daily lives. Another showed a picture of a pregnant woman. “New Germans? We will make them ourselves,” it read. Many voters who spoke to NBC News this week said their chief concern was to try to block the rise of the AfD. Unlike the U.S., Germany’s complex electoral system combines a first-past-the-post structure with proportional representation, to allow for smaller parties to enter parliament. That provides an opening for the AfD. For the first time since German reunification in 1990, a record six parties are set to enter the Bundestag. No party has won an outright majority for 60 years. The difficulty in securing power without a coalition also has to do with the fact that Germans do not vote directly for the chancellor but are given two votes — one for a local lawmaker and one for a party list. 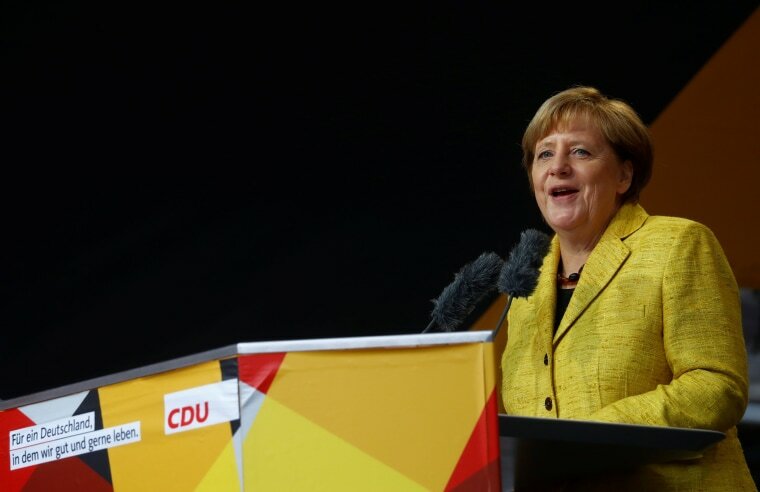 Were the German election system more presidential, analysts say Merkel would likely fare better. The issue of immigration looms large both in the capital and elsewhere. Hassloch has experienced firsthand the challenges of integration, having welcomed some 180 refugees into their community. Drotlett, a primary schoolteacher, has two 8-year-old refugees in her class. Others shared anecdotes alleging alcohol and drug abuse among refugees. “People have commented that they’ve seen refugees carrying crates of beer,” said Harald Sauer, who runs a bar off the bellwether town's market square. “They complain that those who paid into their pension pot for 40 years don’t get as much as refugees." But others said they were proud of Merkel’s decision to open the borders and said integration programs were working. Merkel has repeatedly defended her 2015 decision to open Germany's borders to refugees, saying she would do the same thing again. But on the campaign trail the chancellor has been heckled by supporters of the far-right who chanted “Merkel must go." On one occasion, she was even pelted with tomatoes. The refugee issue has "created a dent in her armor,” said Henning Meyer, an expert in German politics at the London School of Economics. However, Germany’s first female chancellor is still the force to be reckoned with. Born in Hamburg to a Lutheran pastor, as a child Merkel moved to East Germany where she grew up under communism. She went on to become a scientist, studying physics and earning a doctorate in quantum chemistry, before entering politics. And there remains something pragmatic and technocratic about the way Merkel governs. “She’s not an ideologue. She has a practical approach and Germans appreciate that,” ZDF’s Walde said. But her perceived lack of action, or "merkeln," over social inequality has created another fault line during this year’s campaign. “Look at German schools. They’re falling apart. They look like they’re in deep Russia or deep Poland … and we say we’re a rich country,” said Klaus Ulrich, 57, a music manager, who was flying to Dusseldorf from Berlin's Tegel airport. “For me Merkel doesn’t focus on the main problems." But despite disagreement about Merkel's policies, her "Mutti" nickname illustrates her stature.